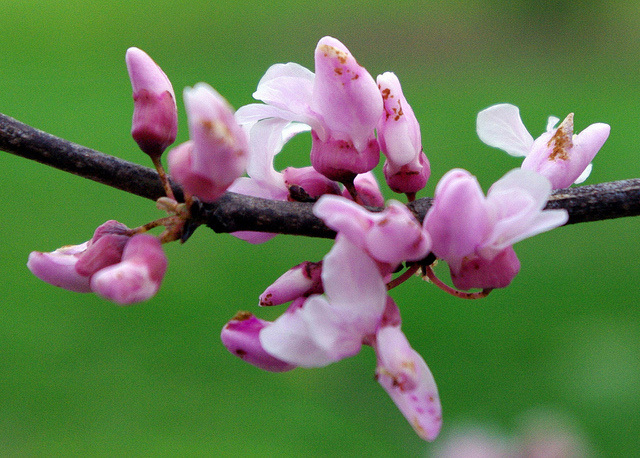 Redbud tree blooming (state tree of Oklahoma). Photo by Anna Hesser on Flickr (noncommercial use permitted with attribution / no derivative works). The lyrics to "Oklahoma, My Native Land" make reference to the state bird (scissortail flycatcher), the state floral emblem (mistletoe), the state tree (redbud), and to Oklahoma's Native American roots (five Indian Nations are represented on the state seal). Lyrics to "Oklahoma, My Native Land"